In a Wednesday morning tweet, Trump confirmed the suspect in the New York truck attack entered the states as part of a U.S. diversity visa lottery. 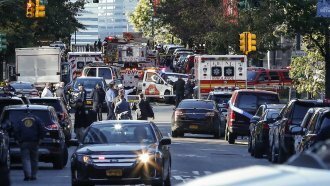 President Donald Trump called for the government to step up its "extreme vetting" after the New York City vehicle attack. On Tuesday, a man drove a truck onto a bike and pedestrian path in NYC. It struck civilians and a school bus. Eight people were killed and several others were injured. Unnamed authorities told outlets the suspect is from Uzbekistan and has been in the states since 2010. He reportedly earned a green card. Uzbekistan is in central Asia and is not included in the Trump administration's latest travel restrictions. In a tweet Wednesday morning, Trump confirmed the suspect entered the U.S. as part of the State Department's Diversity Immigrant Visa program — a lottery system where 55,000 immigrant visas are available annually. The program aims to diversify the immigrant population in the U.S., so selected applicants are mostly from countries with low rates of immigration to the states. Uzbekistan is still on the list of eligible countries for 2018 and 2019. Trump tweeted criticism of the diversity visa program, pushing for a merit-based visa system and "no more Democrat Lottery Systems." That's something he's rallied for in the past. He's supported the RAISE Act, which would rank immigrants applying for visas based on things like education, age, job offers and English-speaking skills.